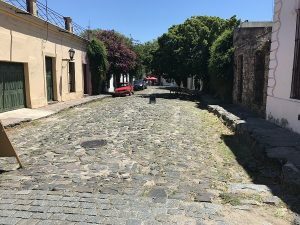 Buenos dias from Colonia, Uruguay! Today the global leaders ventured 40 km across the Rio de la Plata, the river separating Argentina and Uruguay, to Colonia, Uruguay. The Colonia express ferry completes the trip from Buenos Aires in roughly 70 minutes. In Colonia, we were greeted by our tour guide and quickly chauffeured on a walking tour of the Old Town, Colonia. 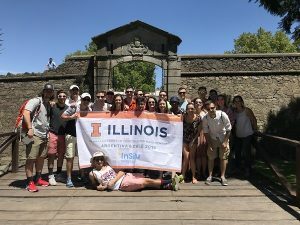 Old town Colonia is encased by a fortified wall as seen in our group picture below – we are posing here on the drawbridge which would raise whenever the town needed to defend itself. This wall, and Old Town Colonia we’re constructed by the Portuguese in 1680. The Portuguese did not have the luxury of claiming Colonia for very long, as the Portuguese and Spanish fought over the town in an on-again off-again battle from the towns conception in 1680, to the final battle in 1777 where the Spanish claimed victory and the town. Consequently, much Portuguese and Spanish influence is prevalent on the streets of Colonia. 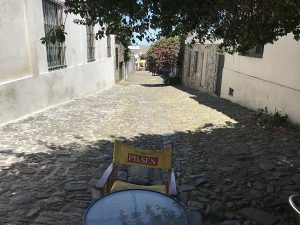 Seen below is a picture of an original Portuguese street, which does not have sidewalks and drains to the center of the street, followed by an original Spanish street, which has small sidewalks and drains to the sides. Uruguay finally claimed its independence from Spain in 1825. However, the newly elected government officials were not on a mission to rebuild the historic city of Colonia. Most of the streets from the Portuguese and Spanish reign are preserved in their original construction, as are many of the surrounding buildings. The global Leaders visited a church which was built in the center of town in 1720. 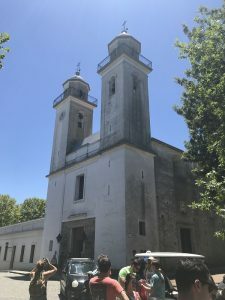 This cathedral featured a chair on the interior which Pope John Paul II used when he practiced a mass in Montevideo, Uruguay in 1987. 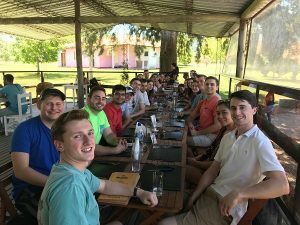 After our walking tour of Colonia, the Global Leaders ventured out of town on chartered vans to a vineyard where we enjoyed the best of Uruguay’s asado and wine. 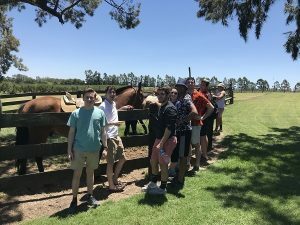 After our meal, a few of us got to enjoy some of the activities the vineyard had to offer, such as horseback riding and a pool overlooking the vineyard. 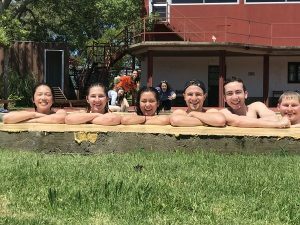 The pool didn’t quite have the same view as the infinity pool last year at Marina Bay Sands (see Singapore, Marina Bay Sands), but a cool dip on a hot day was just the break we needed!